So excited! I got an early anniversary present - the new Chanel COCO NOIR. Classic. 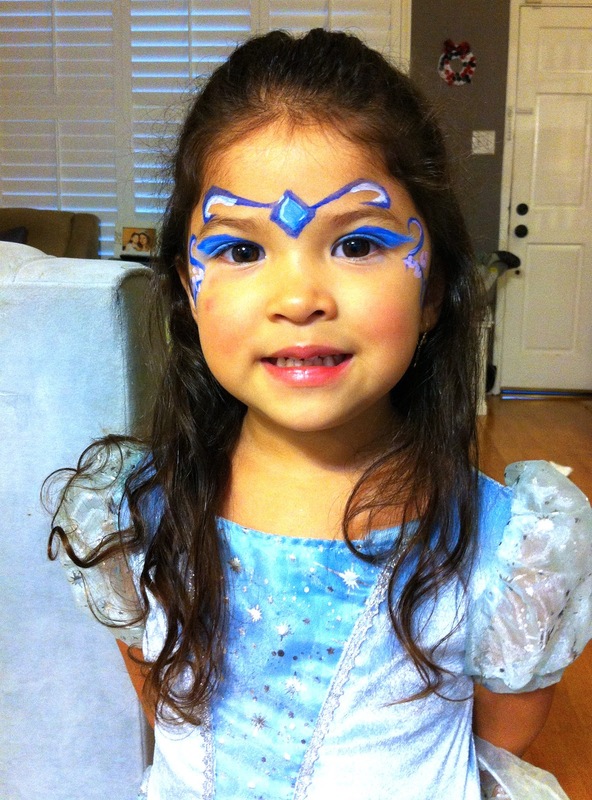 We attended a Halloween party with the kids on Saturday. I normally dress up, but this year I decided to wear my lace mask and a matching lace top. Erik was The Green Arrow (it's actually a really good show - it's become one of our faves). He was so excited to make his last minute costume props himself out of PVC pipe, hemp rope, cardboard scraps, bamboo sticks, and green feathers (for his arrows). It was too cute! 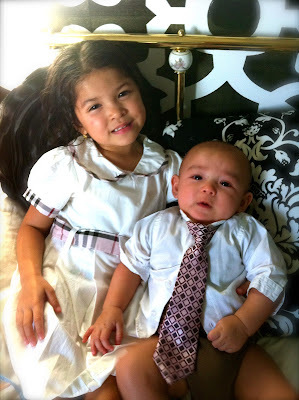 Right when I thought I had decided on the perfect outfit for each of them, just moments after this photo was taken Ryker started crying because his shirt was too tight on him and Keira said she wanted to wear a different dress - so I decided to change their outfits so they both were happy. 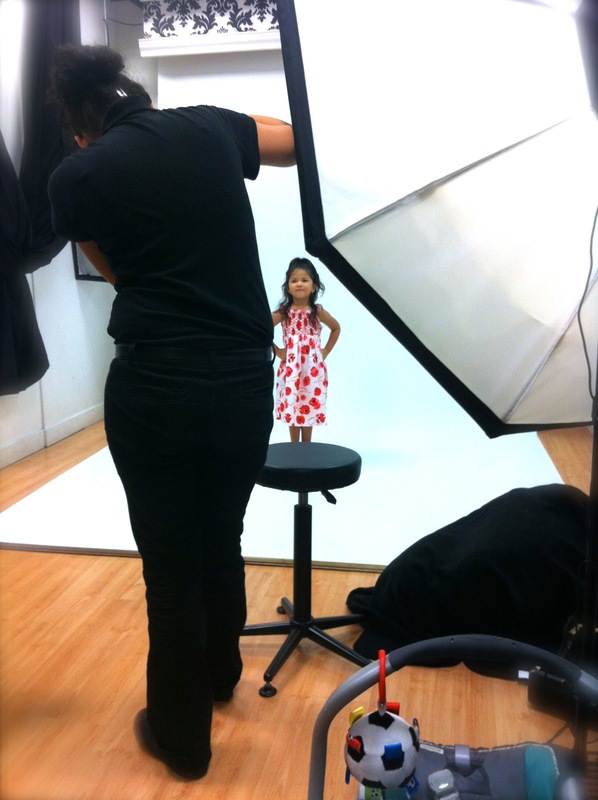 Yup, Keira's definitely not camera shy! Wooo hoo!! 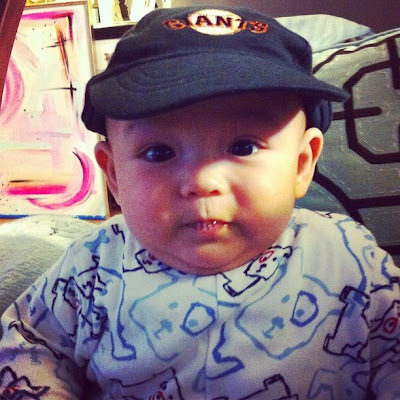 We're proud of our San Francisco Giants for winning the World Series!!! The city is going to be crazy on Wednesday for the parade! Cheers to another week and a HA-HA-HAPPY Halloween! I hope you had a great weekend. 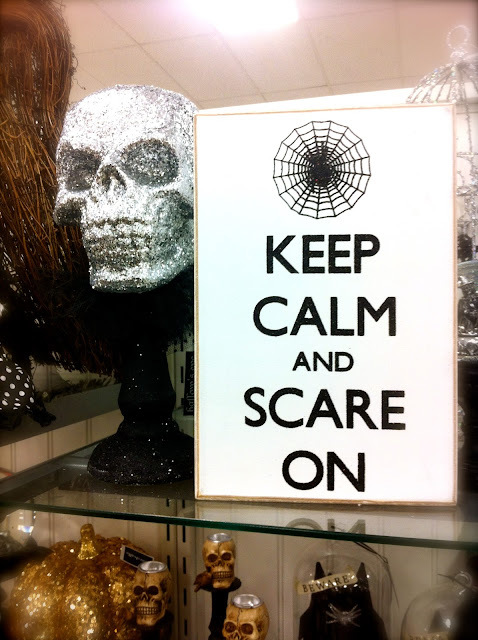 Halloween is already here and I found some pretty glammed up Halloween decorations at Home Goods this year. I'm loving how the traditional carved Halloween Pumpkins have evolved into something you can now incorporate with your home decor - with DIY Chevron painted and Glittered up pumpkins (via my Pinterest) - you're Halloween decor is sure to spice up your own space at home! Cynthia Rowley flat irons that were just TOO CUTE! I love the ikat print and it was only $29.99! I'm usually a vodka martini kind of gal, but since we popped into a Speakeasy themed bar on Friday night I thought I would try one of the many types of Bourbons they had displayed. 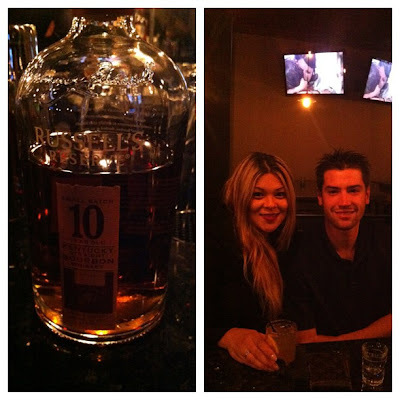 I really liked this one - Russell's Reserve 10 Year Old Kentucky Straight Bourbon Whiskey - it's amazing how much of the caramel and chili pepper spice you can pick up. I had no idea it even contained notes of chili pepper, almond, coconut, honey, and even cumin! I have to apologize for the lag in daily postings – I’ve returned back to work from maternity leave and I’ve also been super busy working on a number of other side projects - sending out VTD orders since Halloween is just around the corner, working on a couple of new commissioned pieces, and focusing on a few more exciting changes and additions soon to come. There’s so many things I want to share with you, but life just flies by so fast sometimes I feel that there just isn’t enough time in a day to do everything I want to do. So, I wanted to thank you all for sticking by me and supporting me, VTD, and following LMS. I'll try my best to post some new photos this afternoon. I can't wait to share! I hope you had a great weekend. 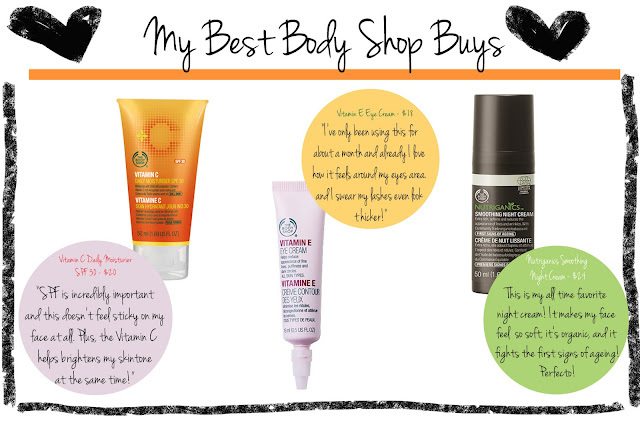 I promise I'll do a Weekend Update soon, but I thought I'd share with you my favorite Body Shop products this morning. I noticed just this weekend when I put my mascara on, that my lashes seemed to be quite thicker and even slightly longer than I remembered them to be. In the past, I've tried out a number of Lash Nourishing Serums that proved to actually work if I applied it twice daily for about 4-6 weeks. However, after I stopped applying them, my lashes would just go back to it's original length. This time I was surprised to see that my lashes were longer without the application of any lash serums! So, I realized then that the only thing different that I was applying around my eyes was my new Vitamin E Eye Cream from The Body Shop! How awesome is that? Talk about knocking 3 birds out with one stone - not only was this eye cream a fraction of the cost of my previous Origins Eye Cream, but it actually mouisturized my eye area very well, AND it even made my lashes look even thicker and longer! At $18 a tube ($12.50 right now since it's on sale online), it's defintely worth it! I'm a big fan of finding designer treasures at TJ Maxx and Marshall's. The price points are great and the fashion is on trend. Here's a few pieces I found at Marshall's that I thought were super cute - I especially love all the sparkly details! If you like any of these, you might still be able to snag them! I'm switching up my "Workspace Wednesday" with something a little more funky - "Wallpaper Wednesday"! 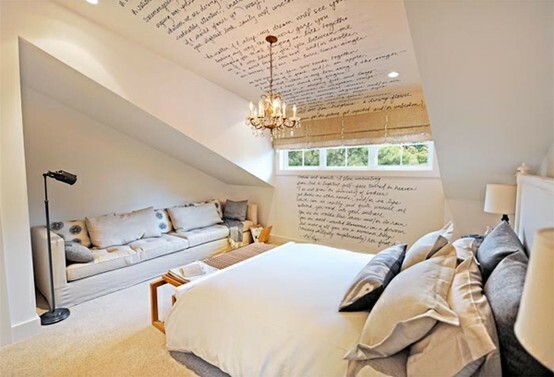 I love the impact that wallpaper can have in room even if it's just on a single all or in this case the ceiling! What a great idea! 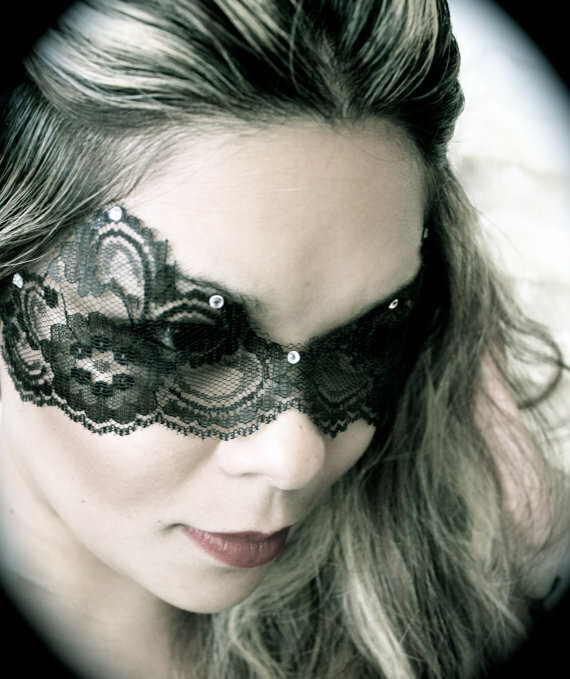 Tuesday Treasures - VTD Lace Masks are Back! Yay! I was luckily able to add a few more lace masks to my VTD SHOP. However, the quantities are still limited and it's been quite popular since Halloween is already in just in a couple weeks! I can't wait! What do you plan on wearing your lace mask with? My Lace Masks have already sold out in just 2 days and I've gotten a few emails asking me if I'll have more in stock in my shop ~ I'm actually checking on that right now and I should have an update for you guys by this afternoon. Please check back at my SHOP by tonight. I can't believe Halloween is here again! 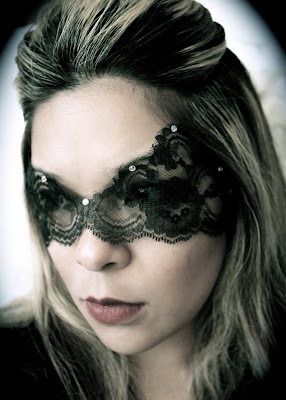 I have always LOVED black lace masks so I thought I would add this to my SHOP. Come check it out! Like I had mentioned in my other posting ~ Even if you don't plan on being Catwoman this year, it would still be gorgeous to wear with just a LBD, some bright red lipstick, and a hot pair of heels! 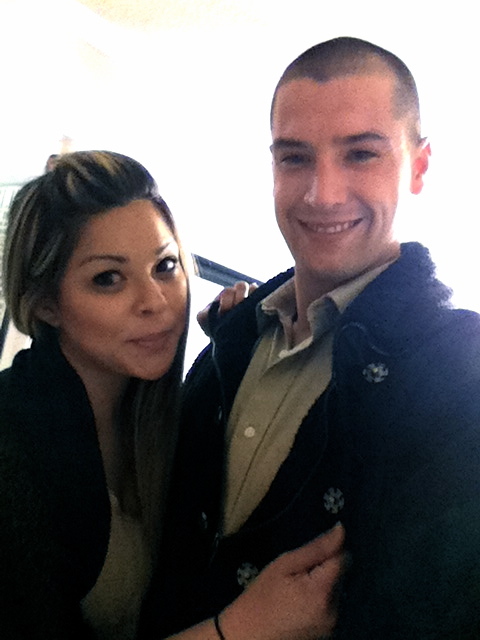 The weather in SF has finally got me wearing my Fall/Winter boots again ~ woo hoo! As much as I love the summer sun, I think I actually may love wearing boots just as much. However, sadly enough, after having two kids I did outgrow a few of my really cool boots which I rarely even got to wear so I'll actually be setting up an online shop to put some of my rarely worn closet treasures up for sale. I should be doing that soon. If you're interested in being notified once it's up please subscribe with your email address above. Also, since Halloween is just around the corner ~ I'll be adding a really pretty Lace Mask to my Etsy shop this weekend! 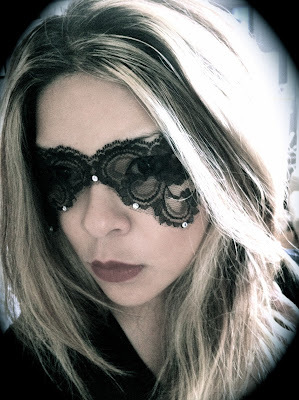 I was inspired by the black lace mask that Catwoman wore in the movie The Dark Knight Rises. 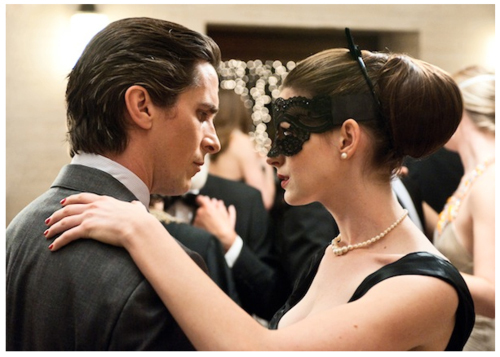 Even if you don't plan on being Catwoman this year, it would still be really pretty to wear with just a LBD and some bright red lipstick and a hot pair of heels! So be sure to check my shop for that this weekend as well. I've been getting an awesome response with my paintings and again I really wanted to thank everyone for all your ongoing support. It's something that I really love doing and finding a way to express myself through my work has been something that I feel extremely blessed to be able to do and your support has really motivated me. On Saturday there is a fundraising event in San Francisco for the Blue Boat Film where they will be showing short films by local filmmakers and raffling off one of my paintings which I did especially for the event below. If you're interested in supporing the cause and would like a chance to win some great prizes, please visit their Facebook page for more details for the event. 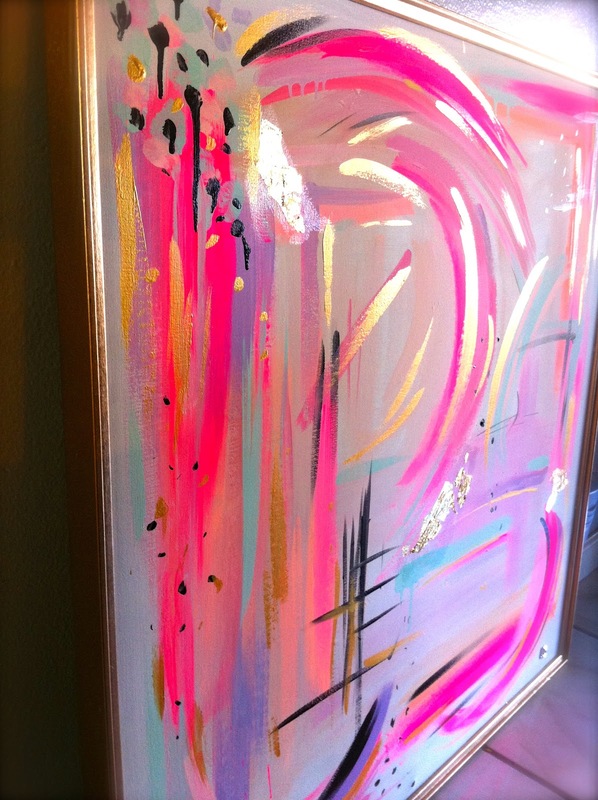 Workspace Wednesday - Viva la Glam! 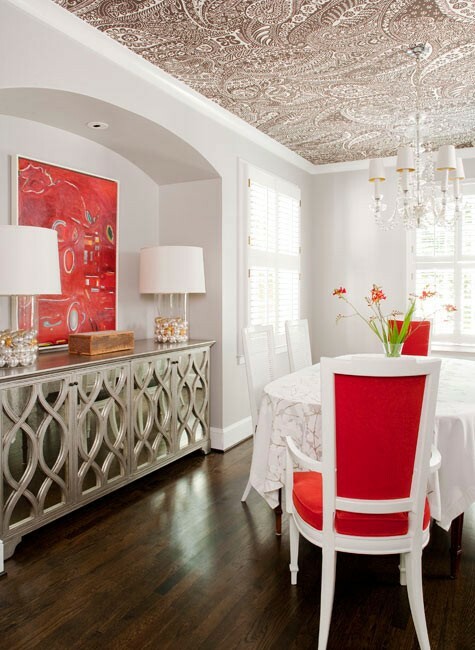 There is no better way to glam up an office none other than with a fabulous chandelier! What do you guys think? 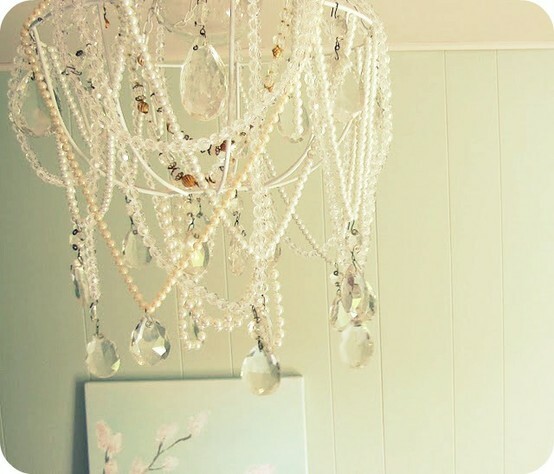 I found this photo below and it gave me a great idea for a DIY faux chandelier effect - just drape pearls and crystals on a circular ring and hang from the celing! Beautiful! Weekend Update - SF Fun! It was another eventful weekend for us and I didn't know just how tired I was until Monday morning when coffee couldn't even quite fix me, but it was all worth it! We celebrated my father-in-law's birthday Friday night with a wonderful dinner and LOTS of sweets! I'm so proud of my daughter - she painted this all by herself with watercolors specially for her Opa's birthday present. 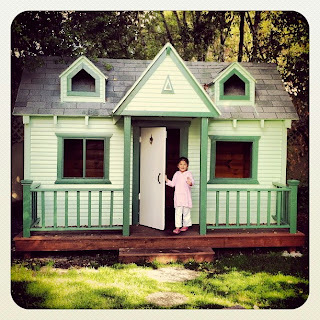 I wish I had this playhouse growing up! 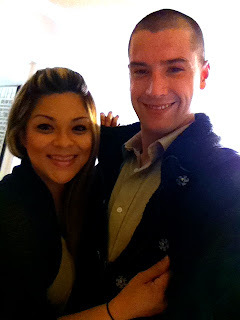 On Saturday, Erik and I made it an adventure to take public transportation into the city instead of driving this weekend since there were seven big events going on all around San Francisco! So, Erik suggested we take the "BMW" this weekend - (Bart Muni Walk)! That made me laugh! 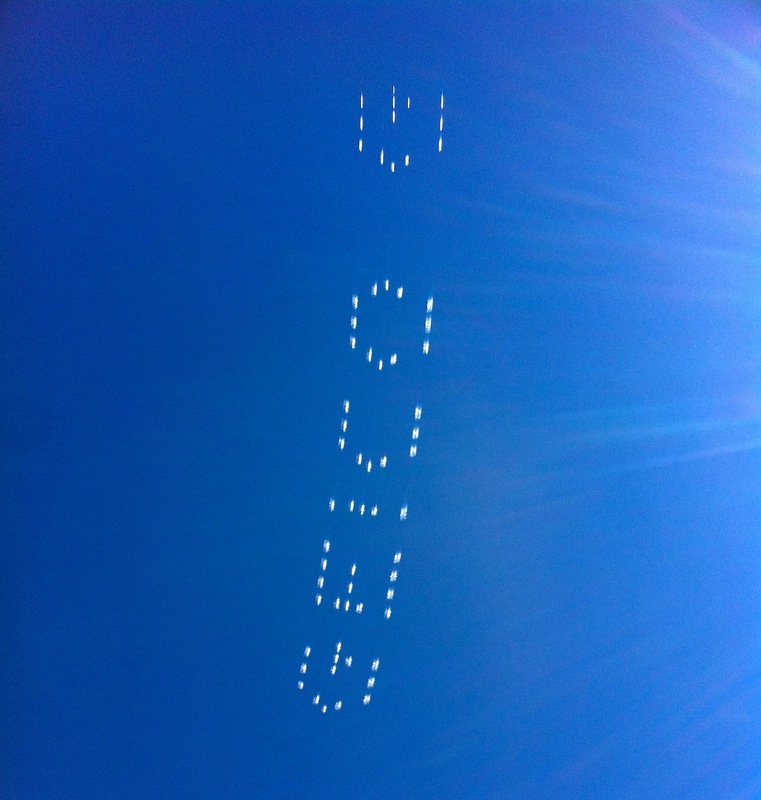 On our way over to the Bluegrass Festival we got to see the Blue Angels spell out "GEICO" in the air! 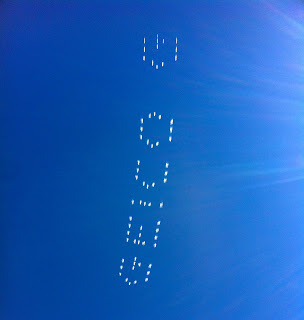 Pretty AMAZING advertising if you ask me! We had a great time at the Bluegrass Festival with some friends just hanging out on the lawn. A friend of ours was a big fan of The Head and The Heart band so we got to watch them on stage. 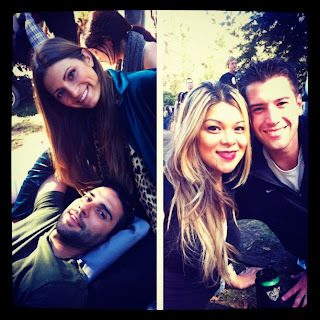 On Sunday we went to Great America with my family to celebrate my brother's birthday. It was a great time! 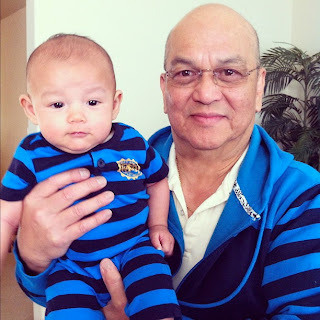 My mother-in-law bought Ryker this adorable outfit and when we saw my Dad that day he was wearing the exact same colored stripe hoody! What are the chances of that? It was so cute! 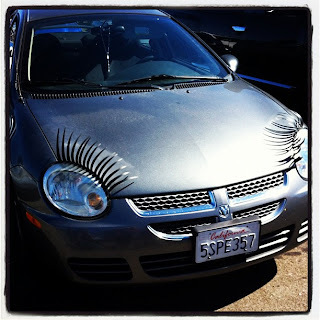 Oh, and check out this cars LASHES! My nephew was cracking up when he saw this in the parking lot!